The International Monetary Fund and the World Bank were created in 1944 at a conference in Bretton Woods, New Hampshire, and are now based in Washington, DC. The IMF was originally designed to promote international economic cooperation and provide its member countries with short term loans so they could trade with other countries (achieve balance of payments). Since the debt crisis of the 1980's, the IMF has assumed the role of bailing out countries during financial crises (caused in large part by currency speculation in the global casino economy) with emergency loan packages tied to certain conditions, often referred to as structural adjustment policies (SAPs). The IMF now acts like a global loan shark, exerting enormous leverage over the economies of more than 60 countries. These countries have to follow the IMF's policies to get loans, international assistance, and even debt relief. Thus, the IMF decides how much debtor countries can spend on education, health care, and environmental protection. The IMF is one of the most powerful institutions on Earth -- yet few know how it works. The IMF -- along with the WTO and the World Bank -- has put the global economy on a path of greater inequality and environmental destruction. The IMF's and World Bank's structural adjustment policies (SAPs) ensure debt repayment by requiring countries to cut spending on education and health; eliminate basic food and transportation subsidies; devalue national currencies to make exports cheaper; privatize national assets; and freeze wages. Such belt-tightening measures increase poverty, reduce countries' ability to develop strong domestic economies and allow multinational corporations to exploit workers and the environment A recent IMF loan package for Argentina, for example, is tied to cuts in doctors' and teachers' salaries and decreases in social security payments.. The IMF has made elites from the Global South more accountable to First World elites than their own people, thus undermining the democratic process. Unlike a democratic system in which each member country would have an equal vote, rich countries dominate decision-making in the IMF because voting power is determined by the amount of money that each country pays into the IMF's quota system. It's a system of one dollar, one vote. The U.S. is the largest shareholder with a quota of 18 percent. Germany, Japan, France, Great Britain, and the US combined control about 38 percent. The disproportionate amount of power held by wealthy countries means that the interests of bankers, investors and corporations from industrialized countries are put above the needs of the world's poor majority. Unlike the path historically followed by the industrialized countries, the IMF forces countries from the Global South to prioritize export production over the development of diversified domestic economies. Nearly 80 percent of all malnourished children in the developing world live in countries where farmers have been forced to shift from food production for local consumption to the production of export crops destined for wealthy countries. The IMF also requires countries to eliminate assistance to domestic industries while providing benefits for multinational corporations -- such as forcibly lowering labor costs. Small businesses and farmers can't compete. Sweatshop workers in free trade zones set up by the IMF and World Bank earn starvation wages, live in deplorable conditions, and are unable to provide for their families. The cycle of poverty is perpetuated, not eliminated, as governments' debt to the IMF grows. The IMF is funded with taxpayer money, yet it operates behind a veil of secrecy. Members of affected communities do not participate in designing loan packages. The IMF works with a select group of central bankers and finance ministers to make polices without input from other government agencies such as health, education and environment departments. The institution has resisted calls for public scrutiny and independent evaluation. To increase exports, countries are encouraged to give tax breaks and subsidies to export industries. Public assets such as forestland and government utilities (phone, water and electricity companies) are sold off to foreign investors at rock bottom prices. In Guyana, an Asian owned timber company called Barama received a logging concession that was 1.5 times the total amount of land all the indigenous communities were granted. Barama also received a five-year tax holiday. The IMF forced Haiti to open its market to imported, highly subsidized US rice at the same time it prohibited Haiti from subsidizing its own farmers. A US corporation called Early Rice now sells nearly 50 percent of the rice consumed in Haiti. The IMF and World Bank frequently advise countries to attract foreign investors by weakening their labor laws -- eliminating collective bargaining laws and suppressing wages, for example. The IMF's mantra of "labor flexibility" permits corporations to fire at whim and move where wages are cheapest. According to the 1995 UN Trade and Development Report, employers are using this extra "flexibility" in labor laws to shed workers rather than create jobs. In Haiti, the government was told to eliminate a statute in their labor code that mandated increases in the minimum wage when inflation exceeded 10 percent. By the end of 1997, Haiti's minimum wage was only $2.40 a day. Workers in the U.S. are also hurt by IMF policies because they have to compete with cheap, exploited labor. The IMF's mismanagement of the Asian financial crisis plunged South Korea, Indonesia, Thailand and other countries into deep depression that created 200 million "newly poor." The IMF advised countries to "export their way out of the crisis." Consequently, more than US 12,000 steelworkers were laid off when Asian steel was dumped in the US. SAPs make it much more difficult for women to meet their families' basic needs. When education costs rise due to IMF-imposed fees for the use of public services (so-called "user fees") girls are the first to be withdrawn from schools. User fees at public clinics and hospitals make healthcare unaffordable to those who need it most. The shift to export agriculture also makes it harder for women to feed their families. Women have become more exploited as government workplace regulations are rolled back and sweatshops abuses increase. IMF loans and bailout packages are paving the way for natural resource exploitation on a staggering scale. The IMF does not consider the environmental impacts of lending policies, and environmental ministries and groups are not included in policy making. The focus on export growth to earn hard currency to pay back loans has led to an unsustainable liquidation of natural resources. For example, the Ivory Coast's increased reliance on cocoa exports has led to a loss of two-thirds of the country's forests. The IMF routinely pushes countries to deregulate financial systems. The removal of regulations that might limit speculation has greatly increased capital investment in developing country financial markets. More than $1.5 trillion crosses borders every day. Most of this capital is invested short-term, putting countries at the whim of financial speculators. The Mexican 1995 peso crisis was partly a result of these IMF policies. When the bubble popped, the IMF and US government stepped in to prop up interest and exchange rates, using taxpayer money to bail out Wall Street bankers. Such bailouts encourage investors to continue making risky, speculative bets, thereby increasing the instability of national economies. During the bailout of Asian countries, the IMF required governments to assume the bad debts of private banks, thus making the public pay the costs and draining yet more resources away from social programs. During financial crises -- such as with Mexico in 1995 and South Korea, Indonesia, Thailand, Brazil, and Russia in 1997 -- the IMF stepped in as the lender of last resort. Yet the IMF bailouts in the Asian financial crisis did not stop the financial panic -- rather, the crisis deepened and spread to more countries. The policies imposed as conditions of these loans were bad medicine, causing layoffs in the short run and undermining development in the long run. In South Korea, the IMF sparked a recession by raising interest rates, which led to more bankruptcies and unemployment. Under the IMF imposed economic reforms after the peso bailout in 1995, the number of Mexicans living in extreme poverty increased more than 50 percent and the national average minimum wage fell 20 percent. Please remember that all of this activity by the IMF has been cunningly planned and orchestrated for centuries and implemented with spectacular success, leaving the uninformed humans wondering why the world is so corrupted and why life keeps getting harder. 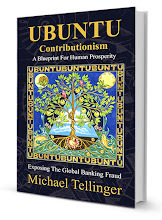 Look out for the new long awaited book by Michael Tellinger on UBUNTU Contributionism - A Blueprint For Human Prosperity - Exposing the global banking fraud. Out soon. Love & Light to all of humanity.